This is a problem that is broader and more complex than any single individual, Church, nation or organisation, and so the least we can and should do is work to collaborate. Where there was once a 25% Christian population in the Middle East it is now around 5%, and tragically 4% of those 5% are in Egypt. Our silence as Churches, nations, and as a world community, has been a contributing factor to this. We have lowered the threshold of human dignity; if people are not dying then it has become acceptable…yet it is up to us to defend those whose God-given rights and freedoms are violated. We are not speaking of people leaving one less than affluent suburb to go to a more affluent one because they seek a better quality of life; these are people leaving war-torn poverty-stricken and conflict-filled near-anarchic states to find protection and safety for themselves and for their families. We as a Church are the largest NGO in the world, although we are much more than just that, we are the Body of Christ. What holds us together is not social convention or international decree. This is a Scriptural directive; a commandment that we live as the Body of Christ, one Body with one Head, and when one part suffers we all suffer, when one part is captive we are all captive. We, as the World Council of Churches, represent these Churches on the ground in the Middle East, and having spoken to many people over the last months and years, and in visiting Irbil, the Greek Macedonian Border, and soon to be visiting camps in Jordan, it has become apparent that Christians are not registered. We must use our Church networks on the ground to aid in the registration process. The Churches on the ground have a pastoral knowledge, experience, respect and integrity, and are trusted by their communities. If people are not registered, they become doubly disadvantaged: persecuted for their religion, Christian or otherwise, and then also by not having equal access to international schemes. We need a unified and unifying approach, to work collaboratively and to understand that we have a role and responsibility to act. This is an ideal opportunity for us to prove that we can effectively and collaboratively respond to this situation, and make a real difference. The conference, hosted by the World Council of Churches in partnership with the United Nations Children’s Fund (UNICEF), the United Nations Fund for Population (UNFPA), and the UN Refugee Agency (UNHCR), runs from 18-19 January 2016. It has brought together 80 leaders of governments, UN agencies, faith-based and non-religious civil society organisations from countries affected by the current refugee crisis in Europe, the Middle East and Africa. 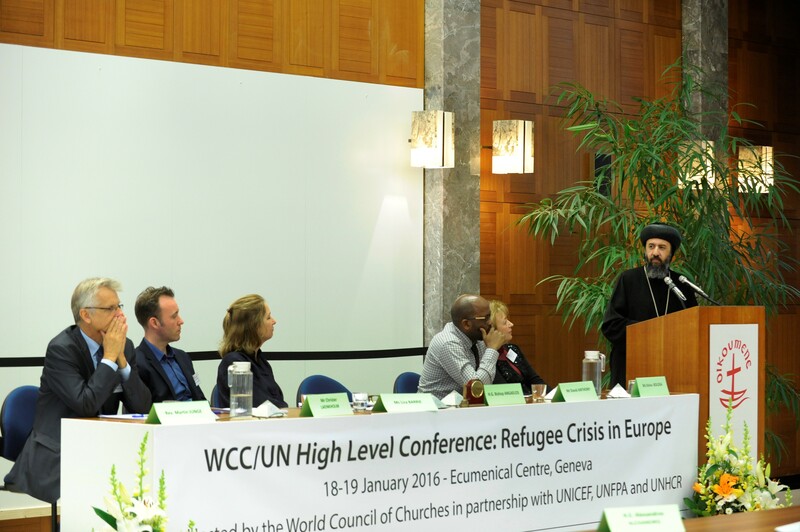 0 Comment(s) to the "HG Bishop Angaelos speaks at High Level Conference in Geneva on Refugee Crisis in Europe"